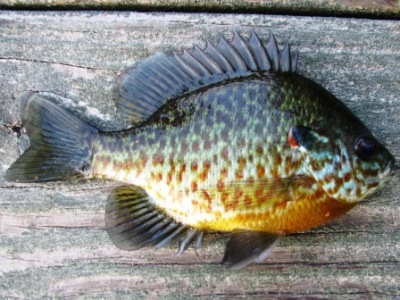 The pumpkinseed is one of the most colorful of the North American sunfish. Pumpkinseed sunfish have an orange or reddish breast and belly. The back and sides are brown to green, marked with patterns of orange, yellow, blue, and greens. Speckling of the flanks is interspersed with a pattern of dark vertical bands and wavy stripes. Pumpkinseed are usually found in shallow areas of farm ponds, small lakes and slow moving creeks. Like most sunfish, pumpkinseed seek out aquatic vegetation or submerged brush and are seldom found in open water. Groups of young pumpkinseed sunfish school close to shore, but adults tend to travel in groups of 2-4 in slightly deeper areas where cover can be found. Pumpkinseed are known for developing a home territory. If fish are captured and moved within a body of water, adults often migrate back to their original location.